Air/vapor in diesel fuel is a common problem with any diesel vehicle where the fuel tank is located at a lower point than the engine. 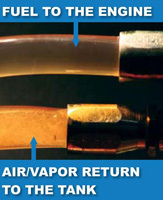 The movement of the fuel inside the tank, and the process of fuel transfer under these conditions creates as much as 10% air/vapor within the fuel. 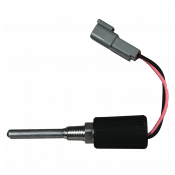 Symptoms of air/vapor can be low horsepower, poor fuel mileage, excessive smoke, injector failure, hard starting, surging and rough running. You can eliminate this problem with a FASS Fuel Air Separation System and get "test cell" performance under real world conditions. 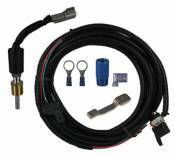 Description: Electric Heater Kit for FASS Titanium series diesel fuel pumps. Description: Replacement Electric Heater Element for FASS HK-1001 Fuel Heater Kit.